For Nuit Blanche 2015, the Phi Center in Vieux Port, Montreal hosted a special show entitled La Nuit Tribe. There was a lot of things happening within the venue, mostly focused on indigenous culture and ethnic practices. Street artists Swarm and Red Bandit were creating a live installation. A video installation by Bear Witness and Jeff Barnaby’s feature film Rhymes for Young Ghouls was being screened. 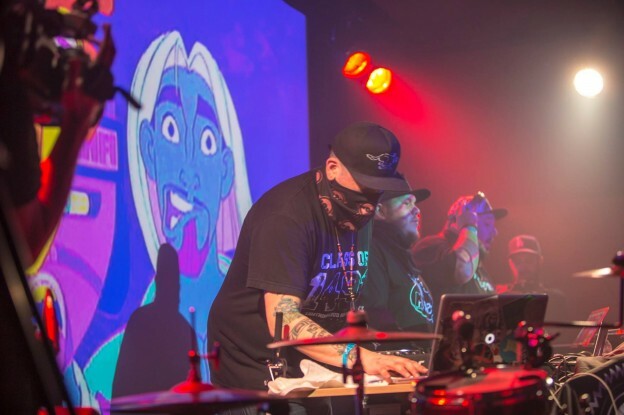 But the highlight of the night for most of the attendees was on the music stage / dance floor where EDM and powwow music was brought together as one. If you’ve ever been to a powwow ceremony, you’ll be familiar with the iterative drumming that forms an integral part of the powwow music. Layered on this are long and harmonic vocables, falsettos and pitch shifts that bring a lot of emphasis on the hard down beats. Now imagine this, but with electronic samples, beats, drops, punches, and love. A basic flow, a bold feeling. Welcome to the “Electric Pow wow”. What tribe plays this, you ask? It’s A Tribe Called Red. Their shows are never just an audio experience. The stage backdrop is showing videos from old movies, depictions of “native” or “tribal” scenes. There are occasionally powwow dancers or hoop dancers too. The stage and venue lights are similarly very beat driven, arousing a rave-like atmosphere. But it’s more than just a rave. There’s something special in the way the audience is responding to the music. There was force, there was moshing, there was a feeling of comradeship as the audience came as one and swayed together, like fingers closing in into a fist. I felt a sense of peace and harmony, as my ancestors long before me must have felt in the days before colonialism. Understanding of colonialism and the present day status of the native population should be a must for any and all listeners of ATCR. They play music from the many tribes that were once part of the many nations across much of North America. They are also all witnesses to the effects of colonialism on their culture and livelihood. What they are doing has a great significance, greater than the feeling one finds at an uplifting rave. They play for the urban aboriginal, and they represent their nations with pride – Ojibway, Nipissing First Nation, Cayuga, Six Nations, and also other nations too, through collaborations. They have also spoken up in favour of the Idle No More movement and against cultural appropriation, and through their music, they are attempting to bring “more attention to that political struggle” faced by first nations throughout Canada and even elsewhere. Such political messages and social depictions were equally alive in the installations elsewhere in the building during La Nuit Tribe, and there were many openings into life in first nation communities that many of us would not be aware of. Yet the unique merge between urban club environment and ethnic culture and sounds that ATCR brought together was definitely a captivating experience. They were followed by AfrotroniX, another brilliant DJ set who mixed electronic music with afrofuturistic ideas and ethnic imagery. It was another brilliant performance, and together, the show conveyed a minimalistic, back-to-the-roots feeling – one in which I was just another member of this dance tribe. And that tribe, would find itself dancing in harmony till the crack of dawn -ergo, La Nuit Tribe. This entry was posted in Reviews and tagged a tribe called red, bear witness, electric pow wow, phi center on March 26, 2015 by admin.